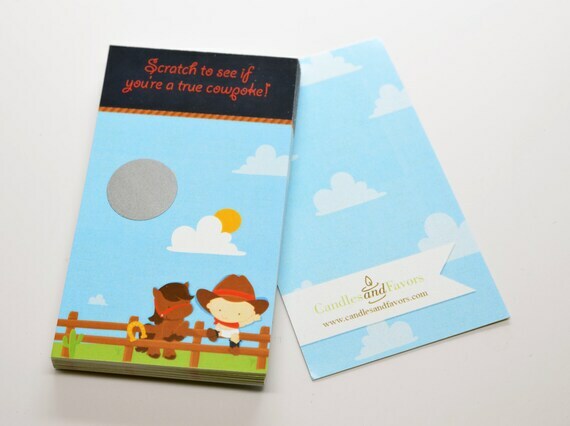 By CANDLES & FAVORS, INC.
Little Cowboy - Baby Shower Scratch Off Game Pack is an easy way to have a little fun at your next Baby Shower. Just hand out one of the twenty games to each of your guests and have them scratch the circle to reveal the one winner! Designed to match our most popular exclusive themes. Each card measures 2" x 3.5" (Business Card Size). Our Scratch Off Game Pack is available in many of our most popular baby shower themes. Products by CANDLES & FAVORS, INC.